Dear Readers, at this time of year a walk through the garden to get to the shed involves pushing through at least one spider’s web, strung at head height. I feel bad as the remains float in the breeze like so many silk curtains, but what can I do? The spiders are everywhere. One has strung her web between the wheelie bin and the drainpipe. Some have fixed their webs around the handles of the bins, so that taking hold of them on collection day is like pushing your hand through so much coarse hair. The spiders have been here since spring – they don’t just appear as the days shorten, as I used to think. But for months, they have been tiny. Only in autumn do they start to come to our notice. Most European spider species will moult their skins five to ten times in their lives, growing larger after each episode of ecdysis (and what a fine word that is!). But in these late golden days, we start to notice the signs of the creatures for the first time. On a misty October morning, it may feel as if a hedge is more web than foliage. 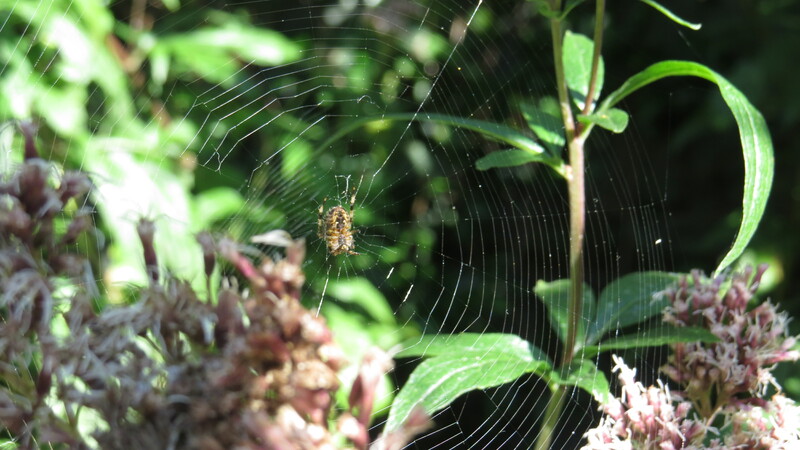 The webs that spiders weave vary greatly between species, from the circular webs that we are all most familiar with in the garden to the sheets and traps made in hedges, or in the corners of windows. But, according to Michael J. Roberts in the Collins Field Guide to Spiders, the webs will vary according to the age and experience of the spider. With practice, you can determine the style of an individual spider. It’s easy to think of small creatures as identical automata, but science is showing us that there is great variation in ‘character’ even among animals that we’ve been taught to consider almost brainless. .’…the spider moves to a relatively high point, stands on ‘tiptoe’ pointing the abdomen upwards, and lets out strands of silk from the spinners. There may be one, or several threads, and pieces of fluffy white silk may be incorporated, increasing air drag like a kite. These strands may fall to the ground or become entangled, but success comes when they are carried upwards. The spiderling is very light and, when the pull of air current on silk is established, it lets go with the foot claws and sails aloft’. Once launched, the little spiders have no control over where they go. They may perish on ice-fields, get eaten by swallows, fall into water or become food for other spiders. Nonetheless, this literal leap into the unknown seems much like what many young humans will have been doing in the past few weeks, as they start school or college, or leave home to go to university. Like all of us at the start of our adult lives, we jump and hope that some kind of net will appear. So, what exactly is spider silk? It’s a form of protein, which is produced within the spiders’ body in the form of strands, and which is exuded by the spinnerets, two glands at the base of the spider’s abdomen. Whilst many invertebrates produce silk, it has reached its highest form in the spider: an individual spider can produce up to seven kinds of silk. Some of it will be thick and strong, for anchoring a web, or supporting the spider as it swings from one point to another at the start of web construction. Some silk will be covered in sticky globules, for catching prey. Yet another is used to wrap the eggs, or to build the sperm package. The names for these different kinds of silk form a kind of poetry: ampullate, aggregate, tubiliform and aciniform. We often hear that spider silk is as strong as steel, and so it is. But what is truly remarkable is its toughness. Toughness is the measure of how hard it is to break a filament of a material, and in this the kind of silk used for supporting the web is tougher than any man-made substance. Darwin’s Bark Spider produces the toughest silk of all, which has been estimated to be ten times as tough as Kevlar. This is a species from Madagascar, which can build webs with strands of up to 25 metres long across rivers. I imagine walking into a web like this would be like walking into a cheese wire. Strands of silk made by Darwin’s Bark Spider over a river in Madagascar. Photo credit and link for this and the orb web at the bottom of the piece. Darwin’s Bark Spider also makes the largest orb web of any species as well, at over 30 square feet. There may be occasions when a spider needs to cut through the silk. For example, a wasp may fly into a web, or the spider may need to do some tidying up because her web has become too visible. Although it might look as if she is biting through the strands, in fact she uses a chemical reaction to cut the silk by regurgitating some of her stomach juices. And because producing silk is such an expensive activity for the spider, she will eat her old webs before she produces a new one, so that the protein is recycled. For all their strength, though, the thing that I love about spiders’ webs is their combination of strength and delicacy, the way that they are both strong and as light as a cloud. And they so often go unnoticed, maybe until a foggy morning shows that every inch of a box hedge is connected with a lace-like lattice of silk, as beautiful and tattered as Miss Havisham’s wedding dress in Great Expectations. It reminds me that invertebrates truly are the little things that run the world. They outnumber us billions to one, but go about their business largely unremarked – at least until the House Spiders start to emerge in search of their mates, or there’s a headline about a tarantula in a bunch of bananas. This autumn, I have suddenly been offered some unexpected work, which will take me away from home. As always, I have mixed feelings: I am delighted to be able to earn some money, and sad that I will be away from the things and people that sustain me. But when I feel down, I remind myself that wherever I am in the world, there is always a weed in the pavement, or a spider in the park. If we have a passion for these things, we are never far from home. This entry was posted in London Invertebrates on September 10, 2015 by Bug Woman. Fascinating. Our house attracts a lot of spiders. I have learnt to accept them. Unfortunately the cleaner is terrified of them, so before she comes, in order to save as many lives as possible, I have to go on a spider rescue mission around the house! Well done, you! I have to take my spiders into temporary captivity when the window cleaners are due, otherwise they get blasted with the high-pressure hose. The things we do for love, eh…. This is a fascinating piece which confirms my admiration for spiders. I hope the time away, for you, won’t mean fewer postings by Bugwoman? Hi Ann, Bugwoman is aiming to maintain normal service – priorities must be maintained! Thank you. Spiders are my silken connection to nature. What a lovely way of putting it, Marla. Well, you learn something everyday, don’t you? I had never heard of the word ecdysis before, so thank you! Baldwin, it’s my word of the month. I’m finding it difficult to find circumstances to use it in, though…..
You’ve got a point there. A bit rude to apply the word to humans with flaky skin, isn’t it?